The tensile strength of grey cast iron, plastic and toughness are much lower than cast steel, but it has a considerable compressive strength as same as cast steel, cast iron is also commonly used in the worst mechanical properties. Meanwhile, the matrix of grey cast iron mechanical properties also have some effect, the ferrite matrix of grey cast iron graphite sheets thick, strength and hardness of the minimum, it is commonly used for the stove parts and some low requirements to tensile strength. Pearlite matrix of grey cast iron has small graphite, have a higher strength and hardness, the main castings used to manufacture the more important. Ferrite pearlite matrix of a graphite cast iron pieces is thicker than pearlitic grey cast iron, so has worse performance than pearlitic grey cast iron. So there are many demand in industry for pearlite matrix of grey cast iron. Good casting properties, good vibration damping, good wear resistance, good machinability and low notch sensitivity. In China, we classified the grey cast iron degree by HT100, HT150, HT200, HT250, HT300 and HT350. For ASTM A48, DIN 1691, ISO 185, JIS G5501 and BS1452 standards, please check the blog of Dandong Foundry. 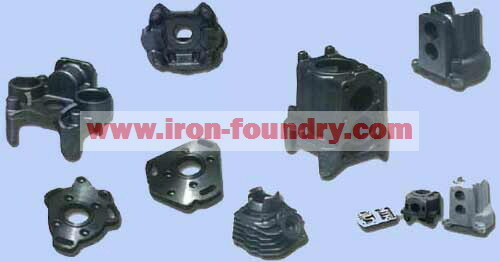 The following is the common application for each degree of grey cast iron for your reference. For small loads, the friction and wear no special requirements for important castings, such as protective cover, cover, oil pan, hand wheels, frame, floor, hammer, small handle, etc.